First, data suggests a mixed picture of the recovery of textile manufacturing in the U.S.
Total capital expenditures in plants and equipment for the textile sector increased by 36 percent in the 2013–16 period. Interesting enough, much of the new investment is by foreign firms, including new investments by Chinese and Indian firms, as well as by firms from Mexico, Canada, Turkey, and Saudi Arabia. At $10.6 billion, U.S. textile exports in 2017 were also below the five-year high of $12.1 billion in 2014. Employment in the textiles sector declined by 4 percent from 131,000 in 2013 to an estimated 126,000 in 2017. Meanwhile, official data on labor productivity index for yarns and fabrics show steady declines during 2013–16. Second, some evidence suggests that reshoring has taken place in recent years in the apparel sector, although on a modest scale. For the 2013–16 period, capital expenditures were up 5 percent to $301 million, suggesting capital investment in the apparel sector may be increasing, as the industry begins to adopt more labor-saving technologies. Domestic shipments of apparel showed modest increases in the past two years, reaching $12.0 billion in 2016 and $12.5 billion in 2017, after a record low of $11.5 billion in 2014 and 2015. Employment in the apparel sector steadily declined during 2013–17, down 21 percent from 145,000 workers in 2013 to 120,000 workers in 2017. Official data on labor productivity also showed steady declines during 2013–16. 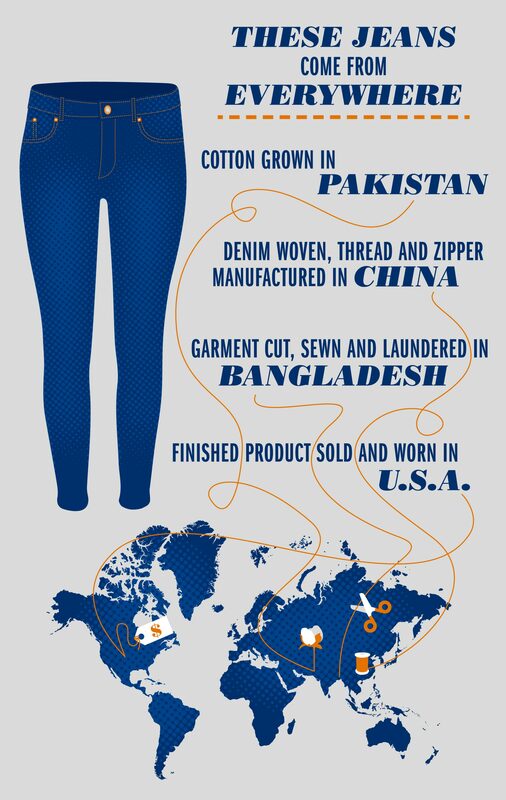 U.S. fashion companies continue to source apparel from the United States, although in a relatively small amount. 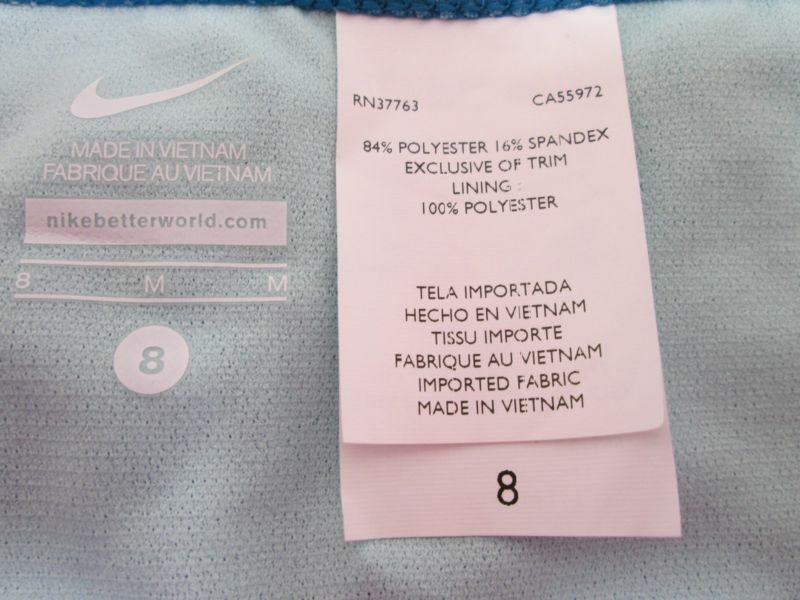 Advantages of producing textiles in the United States include local and state incentives for investment, and the benefits afforded by free trade agreement (FTA) preferences (i.e., the “yarn-forward” rules of origin) that encourage the use of U.S.-produced inputs in downstream production in FTA partner countries, energy cost and the availability and reliability of high-quality cotton. Meanwhile, product innovation and automation are important aspects of the U.S. textile sector’s competitiveness strategy. 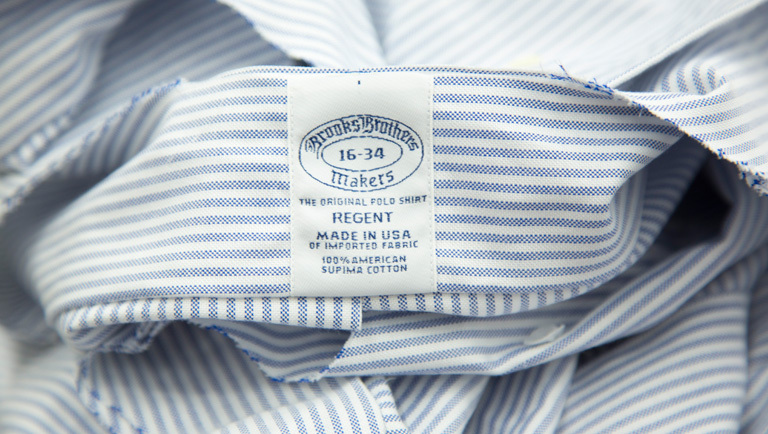 Advantages of producing apparel in the United States include improved lead times, better quality control, and more flexible production. 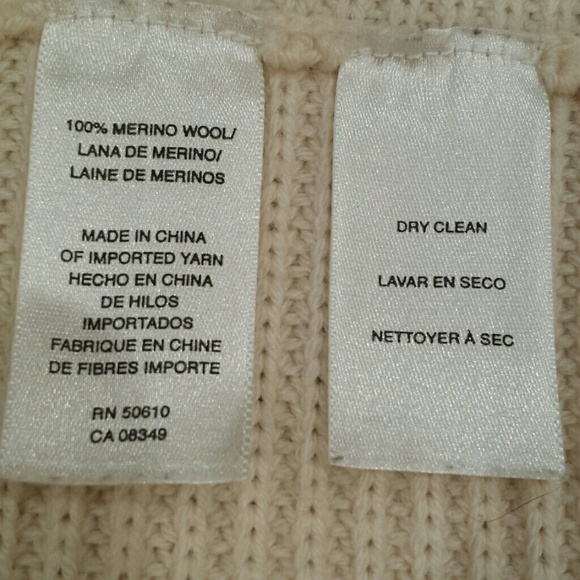 Many domestically made products also use “Made in USA” branding to capitalize on the buy-American trend and the appeal of “Made in USA.” The adoption of various automation and digital technologies to accelerate the process of product development, improve the fit of the final product and reduce the needs for skilled sewing operators may also help improve the competitiveness. 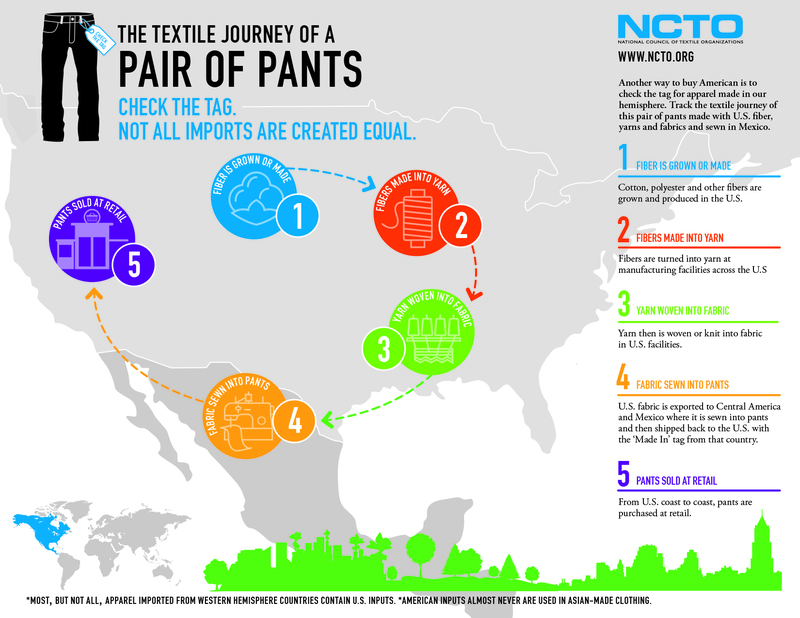 Why does the U.S. textile industry call for additional tariffs on textile and apparel imports from China whereas U.S. fashion brands and apparel retailers oppose the tariffs? Based on the trade theories we have learned so far, why or why not would you recommend President Trump to impose 25% punitive tariffs on imports from China? 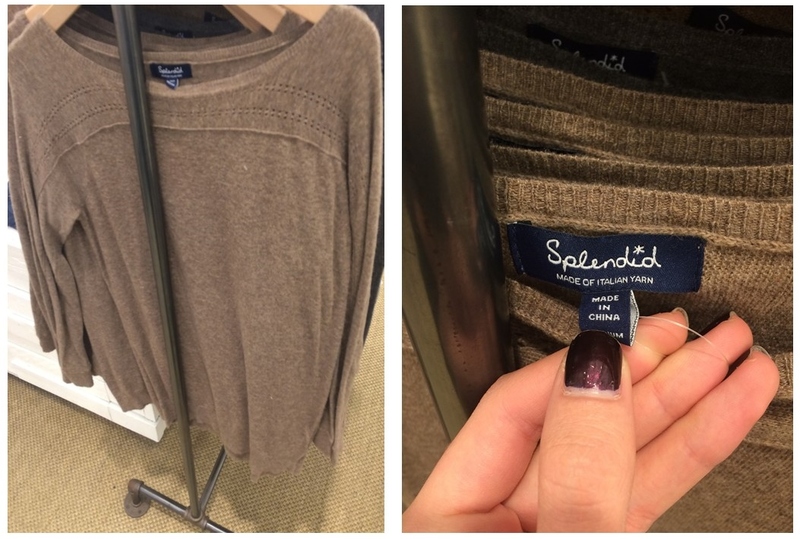 While shopping in SoHo (NYC), Nicole Farese, a student from FASH455, found the label of a Splendid sweater reads “Made of Italian Yarn” and “Made in China”. Splendid is a casual wear store which is known for their high-quality clothing sold at a premium price. Exercise: Check your wardrobe and can you find any clothing that is also made through a “global supply chain?” Please feel free to submit your picture with a brief description of your item to shenglu@udel.edu. The Bureau of Industry and Security (BIS) under the U.S. Department of Commerce recently released its assessment report of the U.S. textile and apparel (T&A) manufacturing sector. The report was based on a survey of 571 U.S. T&A manufacturers in summer 2017. These respondents include 230 textile mills (NAICS 313), 128 textile product mills (NAICS 314), and 213 apparel manufacturers (NAICS 315). U.S. T&A manufacturing has shrunk significantly: the value of T&A shipments (seasonally adjusted) in 2016 ($68 billion) was almost 56% decrease in real terms since 1995 ($153 billion). U.S. T&A manufacturing has undergone substantial structural change: textiles and textile products accounted for 82% of the total shipments of the U.S. T&A industry as of 2016, compared to 57% in 1995. Notably, only 18% of shipments came from apparel manufacturing in 2016, compared to 43% in 1995. U.S. T&A manufacturing sector is hiring less: Between 1990 and 2016, total employment decreased by 79%, from 1.7 million to 352,000 workers; over the same period, over 86% of apparel manufacturing jobs disappeared. North Carolina hosted the largest number of U.S. T&A facilities (22 percent of the respondents), followed by Georgia (10 percent), and South Carolina (9 percent). China, Mexico, and Canada are the most popular destinations for foreign investments by U.S. T&A manufacturers. Respondents listed a total of 1,309 U.S. competitors and 552 non-U.S. competitors. Chinese companies were cited as the number one source of foreign competition. “Quality,” “Lead Time,” and “Innovation” were the top three competitive advantages of U.S. T&A manufacturers as they related to foreign competition. “Labor Costs” was regarded as the top disadvantage of U.S. T&A manufacturing. 43 percent of respondents believed that reshoring was occurring in U.S. T&A manufacturing. Almost all of these respondents believed that “Shorter Lead Times” and the “Marketability of the ‘Made in USA’ Label” were the factors driving the trend. The Affordable Care Act (ACA), Minimum Wage regulations (Federal, State, and Local), and U.S. Trade Policy were the top governmental regulations and provisions cited as negatively impacting the competitiveness of U.S. T&A manufacturers. 61 percent of respondents reported that they had difficulties hiring and/or retaining employees for their T&A operations, specifically production line workers such as operators and machine technicians. The skill gaps in the labor market for those positions were by far the biggest ones identified for the industry. 43 percent of respondents believed that reshoring was occurring in T&A manufacturing (i.e., the practice of transferring a business operation that was moved to a non-U.S. location back to the United States.) Textile manufacturers were more likely to be aware of reshoring. On average, respondents say 48 percent of their textile and textile products are “100 percent made in the U.S.”, while for apparel it was around 54 percent. U.S. T&A exports dropped 10 percent between 2012 and 2016, from $2.2 billion to $1.98 billion. On average, exports accounted for only 12 percent of respondents’ total sales. 33 percent of respondents considered themselves to be dependent on foreign sources for supplies, which was highest among textile mills. 37 percent of respondents reported that they considered themselves to be dependent on non-U.S. sourcing for their machinery or equipment. For textile mills, an average of 12 percent of U.S. output was Berry Amendment-related; for textile product mills the average was 21 percent, and for apparel production, it averaged 26 percent. 67 percent of respondents believed that the Berry Amendment had a positive impact on their organization’s business. include a 16-year “sunset period” with a review every six years, at which time the parties can renew the deal for another 16 years. 2) Include textile-specific verification and customs cooperation provisions that provide new tools for strengthening customs enforcement and preventing fraud and circumvention. Based on USTR’s statement, it is likely, although not confirmed, that the US-Mexico deal will allow more limited tariff preference level (TPL) than the existing NAFTA. According to the newly released World Trade Statistical Review 2018 by the World Trade Organization (WTO), the current dollar value of world textiles (SITC 65) and apparel (SITC 84) exports totaled $296.1bn and $454.5bn respectively in 2017, increased by 4.2% and 2.8% from a year earlier. This is the first time since 2015 that the value of world textile and apparel exports enjoyed a growth. Textiles and apparel are not alone. Driven by rising demand for imports globally, the current dollar value of world merchandise exports also grew by 4.7% in 2017–its most robust growth in six years, to reach $17.43 trillion. Particularly, the ratio of trade growth to GDP growth finally returned to its historic average of 1.5, compared to the much lower 1.0 ratio recorded in the years following the 2008 financial crisis. 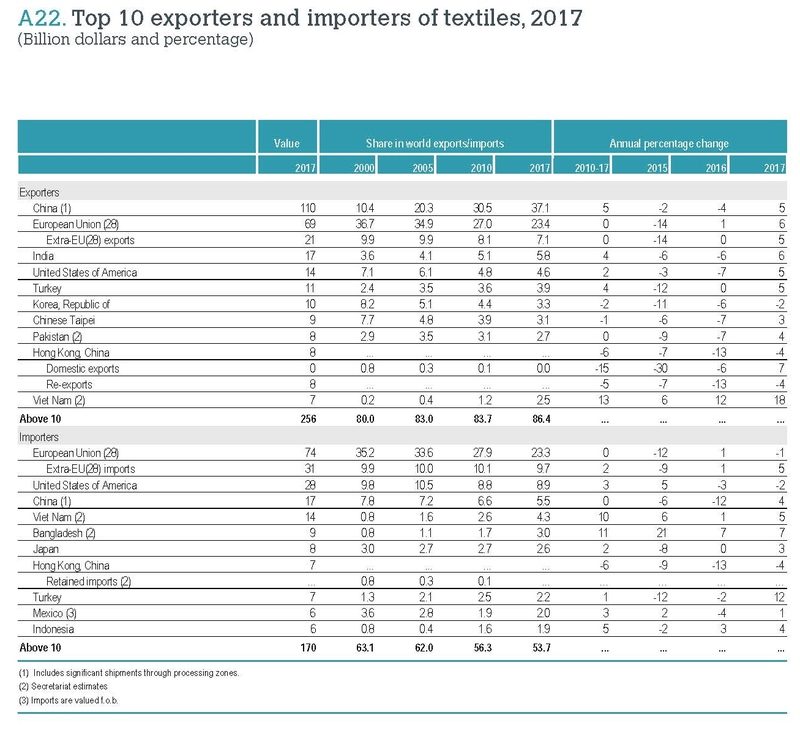 China, European Union (EU28), and India remained the world’s top three exporters of textiles in 2017. Altogether, these top three accounted for 66.3% of world textile exports in 2017, up from 65.9% in 2016. All the top three also enjoyed a faster-than-average export growth in 2017, including 5.0% of China, 5.8% of EU(28) and 5.9% of India. 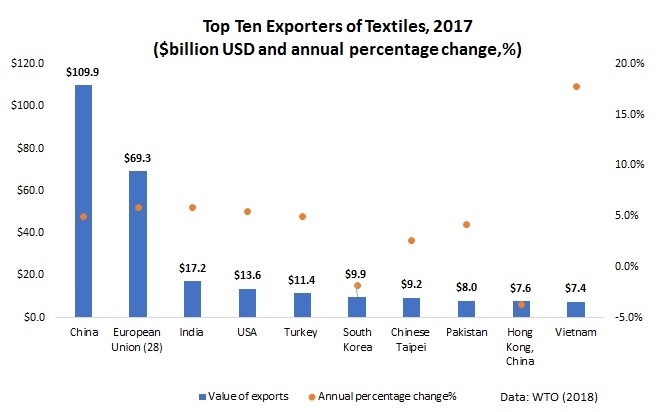 The United States remained the world’s fourth top textile exporter in 2017, accounting for 4.6 percent of the shares, the same as a year earlier. 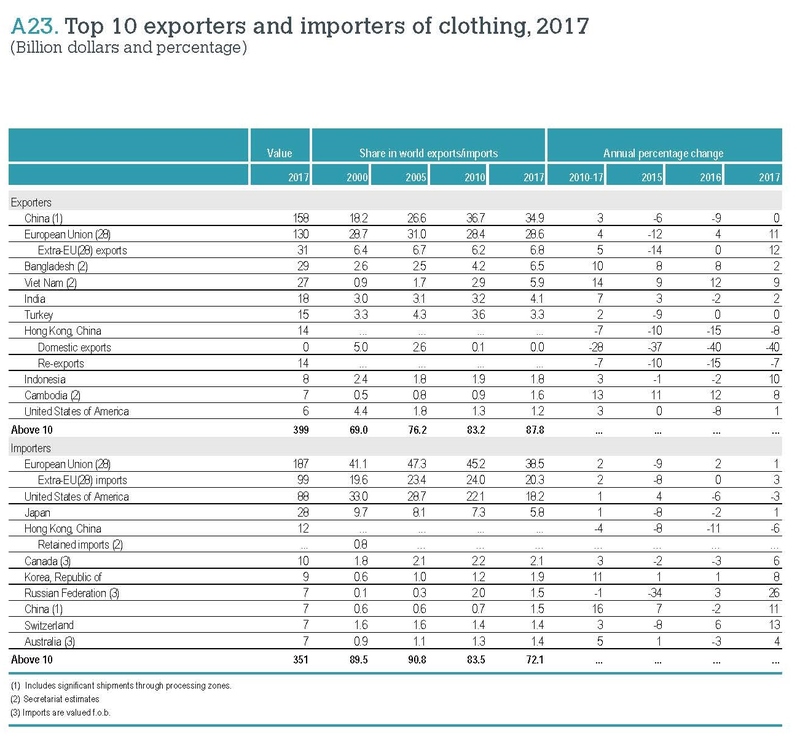 Regarding apparel, China, the European Union (EU28), Bangladesh and Vietnam unshakably remained the world’s top four largest exporters in 2017. Altogether, these top four accounted for as much as 75.8% of world market shares in 2017, which was higher than 74.3% a year earlier and a substantial increase from 68.3% back in 2007. Continuing with the emerging trend in recent years, China is exporting less apparel and more textiles to the world. Notably, China’s market shares in world apparel exports fell from its peak—38.8% in 2014 to a record low of 34.9% in 2017. Meanwhile, China accounted for 37.1% of world textile exports in 2017, which was a new record high. 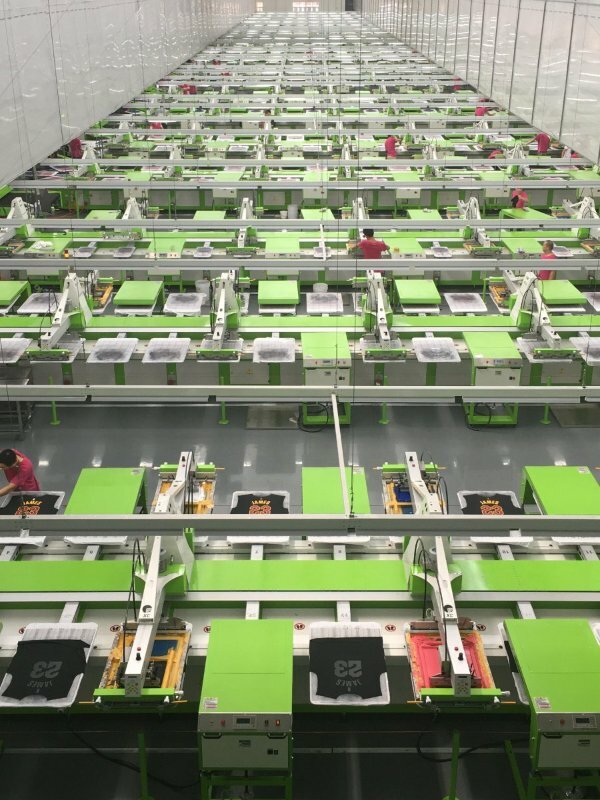 It is important to recognize that China is playing an increasingly critical role as a textile supplier for many apparel-exporting countries in Asia. 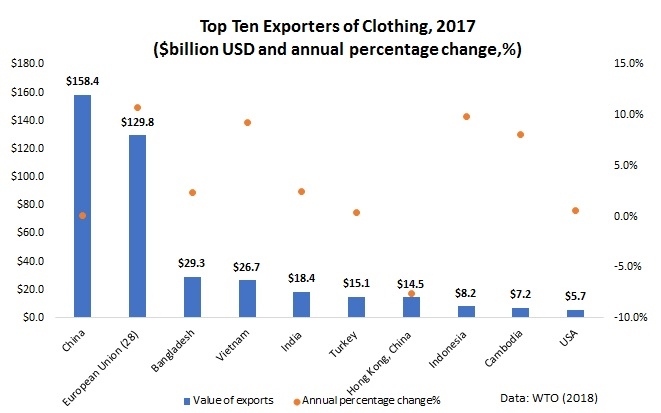 Measured by value, 47% of Bangladesh’s textile imports came from China in 2017, up from 39% in 2005. We observe similar trends in Cambodia (up from 30% to 65 %), Vietnam (up from 23 % to 50 %), Pakistan (up from 32 % to 71 %), Malaysia (up from 25 % to 54 %), Indonesia (up from 28 % to 46 %), Philippines (up from 19 % to 41 %) and Sri Lanka (up from 15 % to 39 %) over the same period. Lu, S. (2018). Changing trends in world textile and apparel trade. Just-Style. Lu, S. (2018). How regional supply chains are shaping world textile and apparel trade. Just-Style.